LEAP 2025 Testing Begins Next Week! Third & Fourth Grade Students will begin testing Monday, April 29th. Testing will last Monday through Friday. Louisiana Elks Association Hoop Shoot Winners! Congratulations to two of our Grand Prairie Elementary students for placing in the Louisiana Elks Association Hoop Shoot Contest! 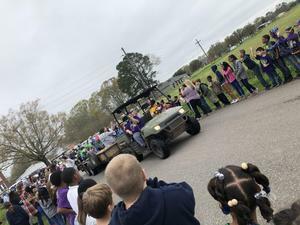 Grand Prairie Elementary students, staff, and family members celebrated Mardi Gras Friday with a traditional Cajun parade, chicken race, and gumbo. Parents, please be aware of the following videos online that are being viewed and discussed by students. Open House will be held on March 20, 2019. Attached are parent guides that provide parents with information on upcoming state testing. Spirit and Pride shirts go on sale today. Attached is the Louisiana Department of Health Immunization Schedule for 2019. The Louisiana Department of Health Immunization Program has updated the Louisiana Immunization Schedule to reflect a new legislative requirement for school entry. Effective July 1, 2019 eleventh graders or students 16 years of age will require two MenACWY vaccinations. Please note that 11 yr. olds (any grade) and/or 6th grade are required to have the first dose of the meningococcal that is mandated for the public school setting as well. Kona Ice is coming to Grand Prairie! Kona Ice will be here serving snow cones during our Mardi Gras Celebration. Please bring between $2-$5 if you or your child would like to purchase a snow cone. Come join us for some Mardi Gras fun Friday, March 1st!